I was raised in the Santa Clara Valley of Northern California before it became known to the world as Silicon Valley. Although urbanized, it still retained a strong agricultural presence in large areas throughout the valley. Surrounded by the hills in the distance and orchards that bloomed each spring, I felt very connected to the Earth and all of nature as a child growing-up in this valley of the orchards. As the valley changed with new industries, I slowly changed with it. The orchards were replaced by asphalt and buildings and the sweet smelling air replaced with smog. The valley, once burgeoning with the fruits of the Earth was now burgeoning with the fruits of technology and a detachment from Mother Earth. The technological revolution had begun with the advent of the first personal computer and with it, a fast paced, insatiable drive for those in the valley to do more and to have more. Eventually, my connection to the Earth and its Spirits was lost and I, too, was accelerated into this new way of living with the belief that success was based on material acquisition. By the age of 29, I was working for a technology company and was in partnerships with two businesses while completing my education at San Jose State University. I was living the American dream of achievement and success. The stress of these achievements was high; I eventually became lost in this fast-paced world. Slowly, my spirit began to die and an empty sadness grew within me. My material possessions no longer fulfilled me and my achievements seemed meaningless. Then what seemed to be the worst turn of events happened. I was laid-off from my job, and my business failed. This forced me to sell my home and lose most of my earthly possessions. My sense of loss and despair were great; my sense of what life was about and my place in it was destroyed. Little did I know that this great loss would be the catalyst for the beginning of my spiritual journey. One of the first steps on my journey was moving to the town of Monterey along California’s coast. Being close to nature and the ocean proved healing; connecting me once again to the Spirits of the Land. 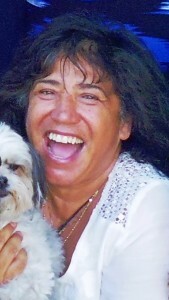 Rebuilding my sense of self and life from the inside out, I began studying metaphysical literature and working with my first teacher, Ginny De Angeles. Ginny introduced me to the basic laws of metaphysics, astrology, the chakra system, the Tarot Deck, and the spiritual teachings of Ernest Holmes, author of The Science of Mind. I also learned basic meditation techniques, daily prayers, and affirmations in order to begin disciplining my mind to focus on the present moment. Shortly after ending my work with Ginny, I met Amitá, who became my next teacher. She opened the door to Shamanism for me by taking me on guided journeys where I would enter altered states of consciousness. Guided outwardly by Amitá and inwardly by my power animals and spiritual guides, I discovered and healed deep childhood traumas and retrieved lost parts of my soul. I was being transformed and re-birthed by this work. I continued to learn how to reclaim this connection to the magical World of Shamanism and integrated the healings into my life. Thus began my process of healing the past and creating a new beginning. At the end of our work together, Amitá gave me my spiritual name, “White Buffalo”, which means “Might Abundance of Light”. During the process of self-healing and working with Amitá, my innate Shamanic nature first came forth during an evening workshop of drumming and movement. I suddenly went into an altered state as I heard the drumming. I began chanting and dancing in a very traditional Native American way; something I had never experienced before. It was this experience that brought my childhood connection with nature back to life for me. The earth, the trees, the ocean and the sky all spoke to me. The animals and birds greeted me. At first, I was frightened and tried to run away but the communication continued nevertheless. Finally, I stopped resisting and embraced this relationship, connecting even more deeply to Mother Earth and all of the Nature Spirits. During this time of self-discovery, I came across the book, Hands of Light, by Barbara Brennan Ph.D., a study of the Human Energy Field and its relationship to health and disease which combined spirituality and psychological processes with hands-on-healing. I was intrigued by Brennan’s scientific background. This satisfied my logical mind for more tangible knowledge of the realm of metaphysics. I enrolled in the Barbara Brennan School of Healing (BBSH) and began formal training in the Healing Arts. The four-year program required a deep level of personal transformational work through a combination of energetic exercises, personal therapy, receiving and performing hands-on healings. I graduated in 1993 and later received my Bachelor of Healing Science degree. After graduating, I became a teacher at BBSH and taught for 13 years, in addition to serving as one of the program’s Assistant Deans. During my time with BBSH I was introduced to John Pierrako’s work, the founder of The Institute of Core Energetics. I wished to expand my knowledge specifically in the area of body-psychotherapy. I became aware of how my own physical body’s structural holding was not in pace with my mental, emotional, and energetic bodies, even though I had several years of personal process work. I was inspired by John’s work, with his vision of supporting the transformation of all obstacles which block contact with one’s own “Core” (“Core” refers to the true authentic self). Core moved beyond the common goals of therapy. It established a unified and holistic process that connected the Mind, Emotion, Will, Body, and Spiritual Self into a whole expression, thus unifying the whole being. Core worked directly with the physical body by evaluating energic blocks in the body and using physical movement to awakened the emotional state of the body and integrated it with the flow of all the bodies. This allowed a free expression of one’s Core Essence. I enrolled in the Institute’s four-year program and graduated in 1995 and became a Core Energetics Therapist. Towards the end of my studies with BBSH I was guided once again to explore my Shamanic roots by moving to Madrid, a small town in the New Mexico desert. During my year-long residency I spent hours walking and sitting in the vast deserts, deepening my connection to the Earth Spirits and further developing my knowledge of Shamanism I performed the sacred art of creating power objects such as drums, rattles, pipes, and smudge feathers for ceremony and healing and practiced rituals on the land as well. One daily ritual was the creating of a “Power Spot” on the land. By sitting on my favorite rock, high above the desert plane and calling in the four directions, asking for guidance from The Spirit of Desert each day, I would hear the same message: “You are to learn the meaning of solitude, to be able to sit so quietly that you can hear your own breath, to become still within yourself that you may know who you are. Only then will you be able to become one with the land”. One day as I sat on my rock a great silence came over me. All I could hear was the sound of my own breath. My spirit expanded until I became one with the land and I embodied the gift that the Spirit of the Desert was trying to give me. I became the desert, a quiet, silent giant that only had to whisper to make her intention known. This profound experience created a deep connection to the Mother Earth. My time in the desert had been completed. Continuing my quest for psycho-spiritual teachings, I enrolled in The Center for Intentional Living, a three-year program covering the full-spectrum of psychological principles from early childhood development through the separation-individuation process, and into adulthood. The program included the study of Trans-personal psychology, object-relations theory, attachment theory, trauma, aging, and dying. This program gave me the in-depth psychological training and application I needed for my own growth, and the growth of my clients and students. It also gave me the ability to apply and integrate psychological principles and early development with spiritual transformation. I graduated from the program in 1998. During this time I felt the need to explore more deeply into my own early childhood missing development, I was guided to Dona Monterelli. Dona’s knowledge of healthy ego development combined with her ability to hold a sacred space that reflected essence and love helped me through a several developmental healings and a profound spiritual emergence and rebirth. Through these healings and awakening, the doorway to my heart opened and I experienced a deep longing to reconnect to my True Nature. Eastern Spirituality became part of my path in the early 90’s and I was called to “sit” with several Indian Guru’s. The first was Gurumayi at the Siddha Yoga Meditation Ashram in Oakland, California. I then traveled to Germany to see Mother Mira, and finally my quest led me to India to see Sai Baba. It was at this time that I experienced my most profound ego death. Rising at four in the morning, standing for hours in line with hundreds of people and sitting for hours on a cold cement floor, to take my turn to crawl on my knees to receive Darshan from the Guru started the process. Then, while suffering from a deadly flu in the vast desert of India, with its striking poverty and endless cycles of life’s impermanence, did I see the hopelessness of fighting our inevitable death. With a roar of fury and anguish, I gave up my need to separate from a God whom I believed had abandoned me, and realized that the only God I was abandoning was myself. This realization ignited in me a deeper awareness of my connection to the Divine within. Love and devotion to God filled the final void of my spiritual journey. I returned from India full of desire for a devotional practice. This desire led me back to Siddha Yoga where I attended several intensives, practicing meditation, devotional chanting and the teachings of Gurumayi on the nature of the ego. I have been devoted to the Path of Siddha Yoga since 1995. One of my most profound spiritual awakenings which later would lead me to my present work occurred after a week- long silent meditation intensive with Gurumayi. After returning home from my intensive, while coming out of a public theater, I experienced seeing hundreds of people who’d gathered in the lobby transform into light beings. I was seeing them all as beautiful shining stars; the essence of their spirits taking form like a fireworks display of many different colors. I heard a symphony of amazing music coming from each individual. It was like Heaven on Earth, seeing and hearing the Divine Core Essence emanating from the individuals around me. I was so touched by this experience that I broke into tears; it was the most sacred experience I’d ever had. My heart was so open I could feel a love for all of humanity in a way that I had never allowed myself to feel. I no longer felt fear, but a deep love for humanity, a great sense of joy in witnessing the beauty of our essence. Then a veil fell and I saw their prison of illusion coming down encapsulating them, creating a separate universe of fear and pain. Their True Essence became dimmed from the prison of fear they lived in. I could hear the lies of the ego being whispered in their ears. The display of fireworks of light and the symphony of sound were gone. My heart started to ache with a sense of pain and loss, it closed down my sight. My heart could see no more. This experience was so touching for me it awakened my soul’s longing to serve humanity. Afterwards, I spent a year praying for a vision of service. I was guided to take a Vision Quest in the Joshua Tree Desert of Southern California. There I prayed for a vision for 5 days. I came out of the desert having received my vision of service; to bring forth my Ancestral Teachings of Shamanism to all who would listen. I now integrate Shamanism in all of my work, from my Sound-Journey Healing Events, Self-Transformational and Training Programs, Workshops and Priv ate Practice. This website’s name ‘Be Heaven On Earth’ is dedicated to the blessings I received that day. The experience of having seen Humanity in all of its Magnificence was like Heaven on Earth; opening my heart and my eyes to see beyond the veil. I now reside on the coast of Northern California in the town of Soquel with my dear love Nana. Here I enjoy nature at my door step, with a family of owls that hoot at me at night and the deer that greet me in morning. I feel a deep sense of gratitude each time I see the sunset on the Pacific Ocean reminding me how beautiful our Mother Earth is. My life is truly blessed. “I have awakened, upon my awakening I have found my longing.